This range of three courses offer those working outside of building based youth projects an opportunity to develop the detached youth work skills required for effective street work. 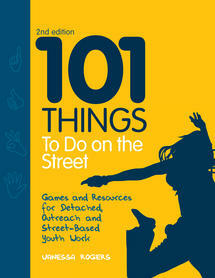 This is a practical training day for practitioners new to street work or those who are planning new projects. Exploring all of the stages of quality street work, from assessing young peoples need through to making contact and enthusing young people to get involved on to evaluating the effectiveness of work done and exit strategies. This session also offers some good practice guidelines for effective detached projects and looks at issues for workers including safety on the streets and effective partnership work. This interactive training day is packed with ideas that practitioners can use to engage young people in positive activities in a detached work setting. On the streets, beach or in a park there is something for both new and experienced workers, including ideas for teambuilding, arts & crafts and ways to deliver issue based work on the street. The workshop is based on the best selling NYA book "Have You Ever?" and includes activities to raise diversity issues, substance misuse and staying safe work. Share and promote good practice based on "what works"
ASBO's, curfews and dispersal orders; youth workers are increasingly being asked to target young people 'at risk' and those involved in anti-social behaviour and engage them in detached youth work projects. But what is anti-social behaviour and why are some young people more vulnerable than others? This is an opportunity for practitioners to explore risk and protective factors, discuss effective ways to engage young people and consider safe working as well as share good practice. "This training gave me a whole range of different ideas to use with young people for issue based sessions - with little equipment and little expense! I enjoyed it very much, best training ever!"